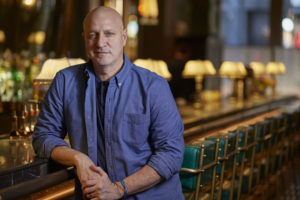 Tom Colicchio is the chef and owner of Crafted Hospitality, which currently includes New York’s Craft, Riverpark and Temple Court; Los Angeles’ Craft Los Angeles; and Las Vegas’ Heritage Steak and Craftsteak. Born in Elizabeth, New Jersey, Tom made his New York cooking debut at prominent New York restaurants including The Quilted Giraffe, Gotham Bar & Grill and Gramercy Tavern before opening Craft in 2001. Outside of his fine dining restaurants, Colicchio opened ‘wichcraft – a sandwich and salad fast casual concept rooted in the same food and hospitality philosophies as Craft – in New York City in 2003. In an effort to broaden his long-standing activism around food issues, Tom served as an executive producer to the 2013 documentary “A Place at the Table” about the underlying causes of hunger in the United States. This eye-opening experience led Tom on a journey to Washington DC where he has been a mainstay in our nation’s capital in the years since. From holding members of Congress accountable on their voting records around food to working with former FLOTUS Michelle Obama on the Healthy Hunger-Free Kids Act, Tom has established himself as the leading “Citizen Chef” advocating for a food system that values access, affordability and nutrition over corporate interests. Tom and his restaurants give back to the community by serving on the boards of Children of Bellevue, City Harvest, and Wholesome Wave. He lives in Brooklyn with his wife Lori Silverbush and their three sons. When he’s not in the kitchen, Tom can be found tending to his garden on the North Fork of Long Island, enjoying a day of fishing or playing guitar. Craft (2001) – James Beard Award-winning restaurant serving a menu celebrating the finest single ingredients, expertly prepared. Craftsteak (2002) – Refined, contemporary fine-dining restaurant inside MGM Grand serving steaks, seafood & cocktails. ‘Wichcraft (2003) – Sandwich shop rooted in the same food and hospitality as Craft with six locations. Craft Los Angeles (2007) – A restaurant highlighting the natural flavors of California ingredients in an airy main dining room in Century City. Riverpark (2010) – A dynamic culinary destination beside the East River, featuring a sophisticated farm-to-table menu showcasing produce from the on-site farm. Heritage Steak (2013) – A modern steakhouse in the Mirage Las Vegas featuring carefully-sourced beef and seafood cooked by open flame. Temple Court (2016) – A restaurant reflecting the cultural and culinary history of lower Manhattan in a historic space in lower Manhattan in The Beekman, a Thompson Hotel.